Are these Wucai bowls Daoguang period? 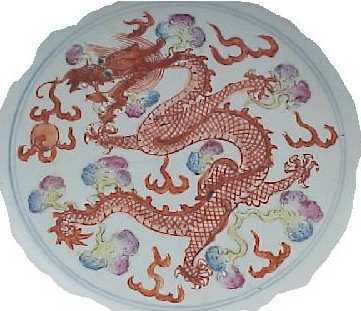 I have attached some pictures to this email that reflect a pair of Wucai bowls, that I purchased at auction. They were sold as Daoguang period pieces and carry the seal of Daoguang. I talked to the auctioneer about provenance, and they came out of an estate together with many other fine pieces, where the deceased was a large collector of Chinese Porcelain and well respected. They are 20.2cm in diameter and are undamaged. I have read a couple of articles about Wucai in Arts of Asia, and looked up auction records from Sotheby's sale in Hong Kong 96 and 98 that both have Wucai bowls from the same period. There is a few differences between mine and the ones at auction; for instance mine are 20.2cm the ones at the auction was 15.9cm, mine do not have the ba jixiang with ruyi symbols, and my red dragon has a red mane instead of green in the auction samples. Some experts here say they are resent reproductions by someone who have seen the pictures. I was under the understanding that certain liberties were taken during the manufacture by the artist, and that not two were exactly alike. The experts here feel they should be exactly like the ones at auction, with no deviation in design whatsoever, please help. I have to advise you that in a specific case like this it is very hard to be decisive based on a picture only. The presence of an Imperial seal mark under the bowls indicates that they should have been made on Imperial order. In that case the designs was very carefully executed. No mistakes were allowed and any piece with the slightest deviation in shape, size or decoration was discarded and smashed to pieces. So, I can't do anything else than give your local experts right in that your bowls seems to be recent reproductions - or at least not intended for imperial use. I enclose a direct scan of a Daoguang mark from a genuine imperial bowl with yellow glaze (above left). Despite the color you can anyway compare this with the marks on your bowls (above right). Please observe that the slightest deviation - and there is several - should be considered very seriously. I am sorry about this negative opinion, but do not hesitate to ask other for more help. I would especially recommend any mayor international Auction House such as Christie's or Sotheby's who are very knowledgeable.